Current version numbers and a link to the corresponding forum announcement thread can be found here. A 'sticky' thread in the Hexagon Discussion forum provides additional information about the build. This BETA version is not available as a standalone installer. It must be downloaded and installed using Install Manager. 1. 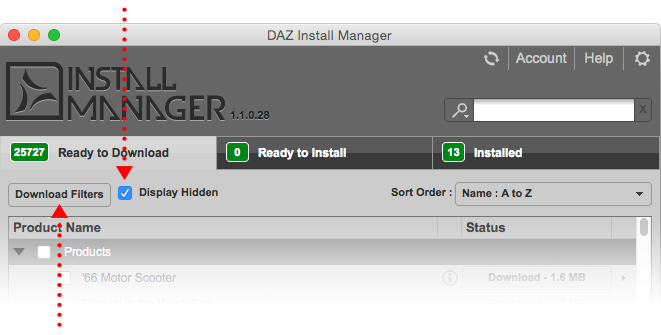 After checking out, open Daz Install Manager and check the box for Display Hidden on the Ready to Download page. 2. Next, click Download Filters and on the Downloads page check the box for “Public Build”. 3. Lastly, on the Ready To Download page, enter “"Hexagon * Public Build" in the filter field and then download and install the files displayed.